Nameplates are available in a wide variety of sizes and materials, including plastic, brass and aluminum. We can supply the nameplate by itself, or mounted on wooden bases, sliding door holders, desktop holders, etc. We can even add your logo for a professional touch! Order one of our classic styles below, or contact our customer service department to place a custom order. 2" x 8" elegant black brass plate on an attractive wood easel. Up to 2 lines of text. 2" x 8" plastic engraved nameplate on an attractive wood easel. Up to 2 lines of text. 2" x 8" engraved replacement nameplate for desktop easels or door signs. Up to 2 lines of text. 2" x 10" plastic engraved nameplate on an attractive wood easel. Up to 2 lines of text. 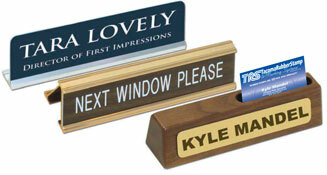 2" x 10" engraved replacement nameplate for desktop easels or door signs. Up to 2 lines of text.